The implementation of one hundred forty one IMPRINT-India projects has got underway. These projects have received support from several ministries, councils and departments in addition to the Ministry of Human Resource development. All the institutions and PIs will approach interested industry partners, alumni associations, State Governments and their agencies for funding 50% cost (MHRD is committed to 50% funding for all these projects). The Ministry will make further efforts at the Minister level for securing approvals of the Ministries involved as per MoU signed for balance 50% funding. 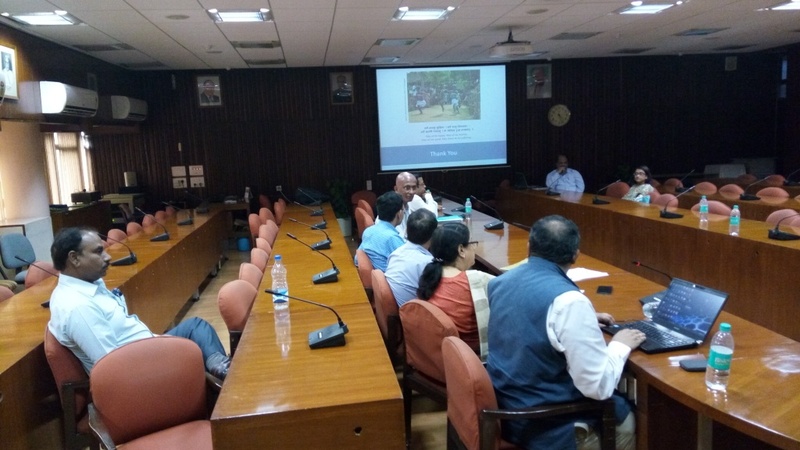 As and when a funding partner is found, the National Coordinator (IIT Kanpur) will release the funds for operationalizing the project from within the funds released by the Ministry. The total cost of the project could be revised without altering the major thrust areas of the Project, in order to facilitate funding participation. It would be clarified after due consultation with the Ministry of Company Affairs whether CSR funds can be used for funding IMPRINT research projects. The minutes also stated that wherever there are remarks for revision of the project, the revised Projects may be submitted to the National Coordinator within specified due date, as per email from IMPRINT central team. 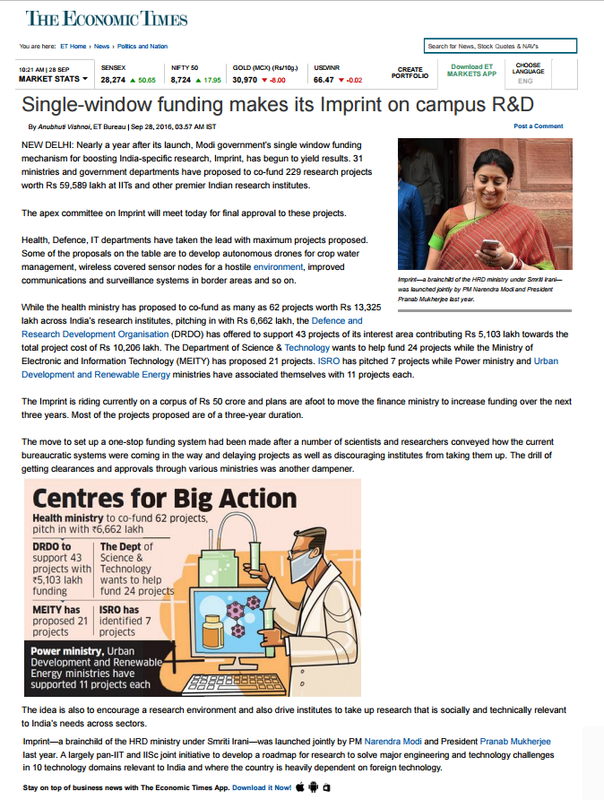 Emails from IMPRINT Central Team are sent to Principal Investigators of all 30 proposals of this domain for which both MHRD funding of 50% and MoHFW funding of 50% (ICMR: 19 proposals, NHM-I: 11 proposals) have been assured, subject to PIs adequately addressing DEC observations and review comments. For ICMR supported proposals, a clinician is suggested to be part of the investigating team. The email to PIs asked to expand the investigating team accordingly, if so required. ICMR in its recent communication has supported another 7 projects of other domains that address health related technology development. Domain wise, these numbers are – Nanotechnology Hardware: 1, Advanced Materials: 2, Information and Communication Technology: 4. For the remaining 43 – 30 = 13 apex committee approved proposals of Healthcare domain, the approval of 50% MHRD funding is received. The proposals of this domain are also are requested to be considered at Ministries / Departments like AYUSH, Drinking Water and Sanitation, Women and Child Development, DeitY, DBT, DST etc. and certain approvals may be come from them. Updates on that will be shared in due course. A DEC presentation on this is available here (Link). Additionally, PIs and higher offices at PIs’ institutes are welcome to arrange support for these 13 projects for the remaining 50% (outside Govt. Ministries / Dept.s which is being pursued by MHRD) for which IMPRINT Central Team is to be kept informed. The current list of 60 approved projects (to be updated soon) receiving full funding support in IMPRINT-India main website (Link) contains 18 proposals from Healthcare domain. Support received for additional 12 proposals of this domain has been communicated to respective PIs by IMPRINT Central Team. Following Apex Committee meeting, mails are now sent to Principal Investigators by IMPRINT Central Team for Phase-III proposals that are selected for funding. Review comments are expected to be made available soon to all Principal Investigators. The communication further says that it may take some time to complete the in-between processes before fund gets released. Approved proposals for each individual domains are enlisted in IMPRINT-India main mother website. This can be accessed from following link. A news article published today, just before the Apex Committee Meeting. The video conference held on September 12, 2016 discussed current status of all ten domains of IMPRINT. Each domain is now done with Domain Expert Committee (DEC) level discussions and has also completed first round of meeting with Ministries. As a follow up activity, certain fields like abstract, deliverable, budget etc. of specific proposals are now being shared with Ministries who might be interested in supporting them partially or fully. The outcome of all these exercises will be placed in the Apex Committee Meeting of IMPRINT scheduled on September 28, 2016. 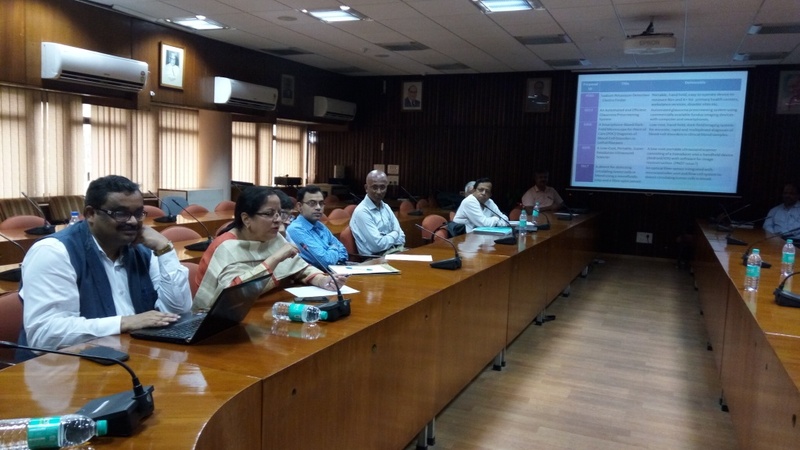 This meeting is supposed to come up with the list of approved proposals for all ten domains and also provide the guideline for execution of IMPRINT Projects. After this 28th Sept. Apex Committee Meeting, decision on IMPRINT Phase 3 proposals for all ten domains will be communicated to respective Principal Investigators by IMPRINT central team. 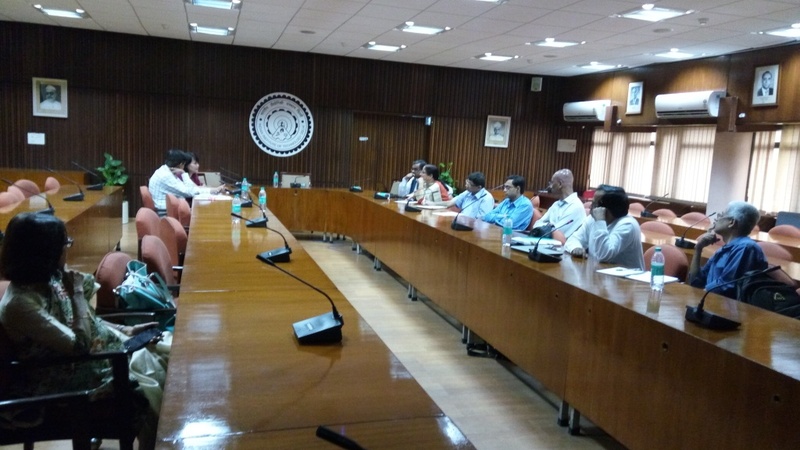 An MHRD arranged meeting with representatives of other Ministries for IMPRINT-Healthcare domain was held on 24-08-2016 during 3:00 – 4:00 PM at the Senate Room, IIT Delhi. 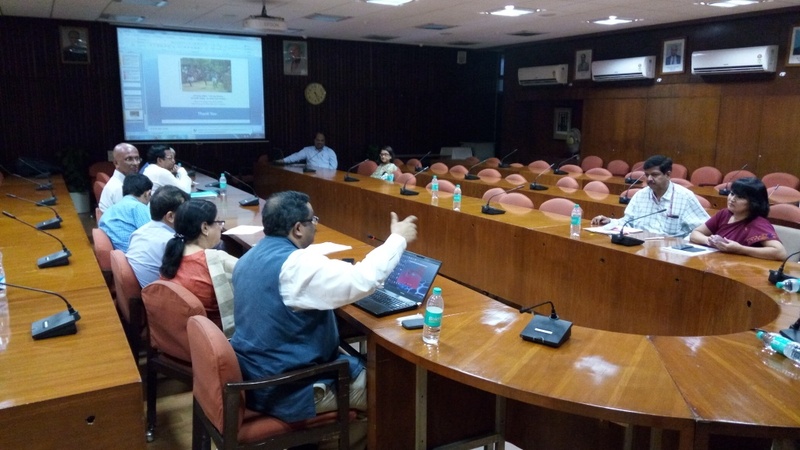 Professor Partha Pratim Chakrabarti, Director, IIT Kharagpur chaired this meeting. The aim of this meeting was to explore partial or full support of proposals of this domain to complement the MHRD support. After the presentation made on behalf of the Domain Expert Committee, initial interest in certain proposals from certain Ministry was noted. More from them are expected in coming days. It was also decided that the proposals would be taken to other Ministries who could not make it to the meeting. This includes Ministries who had not signed the MoU but might find the proposals of interest to them. It was suggested that a login might be provided to the Ministry representatives to access the proposals from IMPRINT portal. The earlier scheduled Apex Committee Meeting of August 08, 2016 is postponed to second week of September (tentative) 28th Sept., 2016. This meeting will take final decision on all proposals, following which communication will be made to respective Principal Investigators. The window for IMPRINT Call for Proposals, final proposal submission for Phase III of the evaluation process, has been extended till 11.55 pm, July 17, 2016. Respective Principal Investigators (PIs) have been informed of this in their registered email id by IMPRINT Central Team. Since there is a requirement to complete the Phase III review early, we encourage PIs not to wait till the last date of the extension period and submit full proposal as and when it is ready, preferably within the pre-revised deadline of July 10, 2016 or a nearer date. We shall get started with the review process from July 11, 2016 itself with proposals that get submitted. We hope that the result of any of the proposals need not be held up due to delay in getting that proposal reviewed. The guidelines and tips below are serially arranged as per the format of the final proposal for IMPRINT Call for Proposals Phase III evaluation given further below. The guidelines and tips are meant to help PIs plan and organize their submission precisely. The team may include PI, Co-PIs, partners, and collaborators who would directly be involved for the execution of the project and collectively own the responsibility. Please note that your proposal must strictly adhere to the format including word/page limit and be submitted in a single pdf file with less than 8 MB file size. List of appendices may have an additional, up to 2 MB, of combined file size. Non compliance may disqualify your submission or cause inordinate delay. Title should succinctly represent the theme of the project. Abstract should capture the main objective, motivation, research plan, deliverables and novelty of the project. Objectives should highlight the main goals or aims of the project. Budget should conform to the declared guidelines. Current status should clearly bring out the back ground or genesis, motivation and open questions prevailing in the field, and thereby, justify the objectives and connect to the deliverables. Motivation and scope should justify the overall research plan and its focus. Methodology and research plan should elaborate and convince the reviewer that the proposed work is justified, pragmatically designed and contains enough promise of success and delivery of a feasible and scalable technology. Justification and novelty should provide convincing argument in favor of the project and its approach to the reviewers. Benchmark, milestones and time-frame should define the specifications of the product or technology being developed, identify major milestones or landmarks and provide suitable timeframe to achieve the proposed milestones and benchmark. Industry participation is not mandatory but is desirable and may convince the reviewers about feasibility of the project. Please provide a list of equipment, infrastructure and facilities that are available at host institutions, accessible to the team members and relevant to this project. Please provide any evidence that may convince the reviewers about the feasibility of technology development potential of your project. Please provide a list of potential users who may volunteer to use or test the product developed by you. For final outcome and deliverables, please provide a list that should justify your project as commensurate with the philosophy of IMPRINT (i.e. translation of knowledge into viable technology in the form of a product or process). Please suggest peers or domain experts who will be willing to review your project. Please cite references, used in the proposal, that provide justification or relevance of your project proposal. You may include up to 10 supplementary items (figure, table, photo, letter, certificate, field trial results or any other document) in support of any of the above items of your proposal. Final proposal submissions will be accepted online starting, 28 June 2016, till 10 July 2016. Please carefully read the information provided below to submit the final proposal for IMPRINT Call for Proposals Phase III evaluation. The proposal format is similar to the format for the preliminary proposal submission but not exactly the same. Those fields that were included earlier in the preliminary proposal format you have to submit again. However you do not have to submit the PI and Co-PI details again. The final proposal, in the format described below, has to be attached as a single pdf document (max. file size 8 MB). You are additionally allowed up to ten attachments, not counting the industry participation letter and the forwarding letter from the institute, with a combined file size, of the additional attachments, being less than 2MB. Some of the information you include in the pdf file of the final proposal, you have to ALSO provide directly in the fields provided. Such information fields are the proposal abstract and the proposed budget related fields. Please remember to include the information in these fields in the pdf document of the proposal as well. The proposal should adhere to the following format. Proposals that do not adhere to the format may not be reviewed. You have to make a declaration that you have adhered to the word limits to be able to submit the final proposal. You will also have to confirm that the proposal is submitted through PI from a CFTI (Centrally Funded Technical Institute) or a TEQIP (Technical Education Improvement Programme) granted institute. Please include the following sections in the final proposal. In addition to the text, for fields not marked as “text only field”, you can add a reasonable number of images and tables. We have sent emails with comments as feedback based on Phase II evaluation to Investigators for Correspondence for proposals accepted for Phase III evaluation from Healthcare, Information and Communications Technology and Manufacturing domains. If you do not find the mail in your inbox please check your spam filter. We will be sending feedback mails for other domains soon. We hope the feedback will help in preparing the final proposal for submission for IMPRINT Call for Proposals Phase III evaluation. We will soon enable the submission of the final proposal for Phase III evaluation on this page http://imprint-india.org/proposals/. For any queries please write to imprint@iitk.ac.in. Wait will be over soon! This is to assure all successful project investigators of Phase – II that IMPRINT Central Team is fully engaged and working hard to reach out to you and the wait will be over soon! The deadline of proposal submission is getting extended to July 10 from what was communicated before as July 05. Meanwhile, the investigators can start (if not started already) working on some of the general points that are usually part of a full proposal like this. Five such points are given below. Also, one can think of check-lists e.g. if the proposal is submitted through PI of a CFTI or TEQIP granted institute (as per project call), if it has forwarding letter of institute authority, a letter of support from industry if any (describing nature and quantum of support) etc. and be prepared to do the needful. 1. Current status(within 2 pages): What would be competing with this technology? What would its alternative be? What advantages would it have over competition/ alternatives? To the best of your knowledge, what is the prior art in this space (publications, patents, and patent disclosures)? How novel is your technology relative to the prior art? Would it have freedom to operate in the IP landscape? Is this is an extension of existing research or something totally new for your team. 2. Motivation and scope (< 100 words) : Give a background of the problem you seek to solve with this technology, citing statistics where applicable. Is this technology a new innovation or an improvement on a current solution? How large is the potential impact? 3. Methodology and research plan (2 – 5 pages) : Research Plan: What strategy/ experiments will you need to do to reach your goals? Provide a detailed research plan to meet the specified goals. 5. Benchmark, milestones and time frame : List 3-4 specific and tangible milestones that you propose to achieve within the proposed time line of the grant and at the end of the project – code, prototype, data proving feasibility, etc.